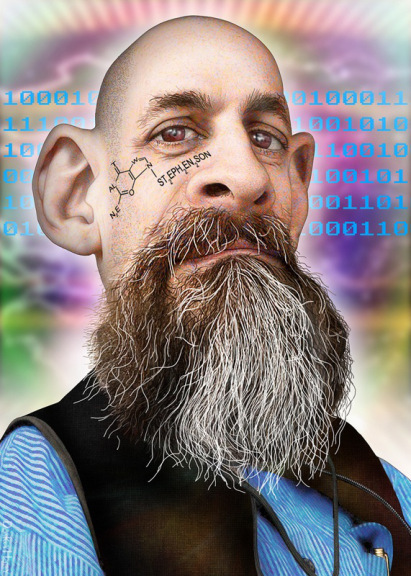 Neal Stephenson, born 31 October 1959, is an American writer of speculative fiction. He explores subjects such as mathematics, cryptography, philosophy, currency, and the history of science. What’s hard, in hacking as in fiction, is not writing, it’s deciding what to write. My niche, to the extent that I’ve got one, seems to be writing about fairly recondite material, but trying to do it in a way that develops into an enjoyable and readable story. Good SF supplies a plausible, fully thought-out picture of an alternate reality in which some sort of compelling innovation has taken place. A good SF universe has a coherence and internal logic that makes sense to scientists and engineers. I was sort of going for broke with Snow Crash. I had tried to write stuff that was more conventional and that would be appealing to a large audience, and it didn’t work. I figured I would just go for broke, write something really weird, and not be so worried about whether it was a good career move or not. SF has changed over the span of time I am talking about—from the 1950s (the era of the development of nuclear power, jet airplanes, the space race, and the computer) to now. Speaking broadly, the techno-optimism of the Golden Age of SF has given way to fiction written in a generally darker, more sceptical and ambiguous tone. When I read a novel that I really like, I feel as if I am in direct, personal communication with the author. I feel as if the author and I are on the same wavelength mentally, that we have a lot in common with each other, and that we could have an interesting conversation, or even a friendship, if the circumstances permitted it. When the novel comes to an end, I feel a certain letdown, a loss of contact. It is natural to want to recapture that feeling by reading other works by the same author, or by corresponding with him/her directly.